Luxury four-bedroom apartment situated in the heart of Verbier within easy walking distance to the main Medran lift station and Verbier’s bars, shops and restaurants. The property faces south-west with exceptional views of the peaks of the Combins Massif and Mont Blanc. The apartment has every conceivable luxury including Jacuzzi bath and steam room, state-of-the-art Crestron technology and iPads in the master bedrooms. Relax in the comfort of this alpine retreat and the outstanding concierge service will be on hand daily to ensure you have the perfect tailor made luxury ski holiday. The apartment has been recently remodelled with every conceivable luxury: aged-wood walls and floors create the warm atmosphere of an alpine retreat while the sleek furniture and latest technology make it a truly modern experience. Two parking spaces offer added convenience. Large windows extend along the South side of the large open plan living and dining area offering a breathtaking backdrop of mountain views. The living room has a generous sofa facing both the contemporary feature fireplace and the magnificent view of the Combins beyond. Listening to music from ‘invisible’ speakers you move from living-dining space to the state-of-the-art, open plan, fully fitted kitchen. State-of-the-art Crestron technology ensures music, blinds, television and lighting, all integrated at the touch of a button on the centralised wall panel. With Apple Mac computers, iPads and iPod docks in master and double bedrooms and in the living room, a pre-programmed music and entertainment system with film library, Apple TV, Sky UK, Sky Italy and cable television. The ski room on the ground floor, conveniently located within the building entrance, is fully fitted for ski and jacket storage and with a heated boot rack. Put on your ski boots, take your skis and walk to the Medran lift station in less than 2 minutes. Relax and unwind in comfort on the sun-drenched covered balconies taking in the stunning panorama of the Alps beyond. Facing South West, in the distance you can see the peaks of the Combins and Mont Blanc. Entertain from the sleek, spacious, well-equipped kitchen (complete with Miele appliances, fitted coffee machine, wine cooler, dishwasher and washing machine) looking through to the warm ambience of the living area. Verbier is an alpine village and holiday resort located in the South Western corner of Switzerland, close to the border of France and Italy. It is world-famous ski resort and is frequented by both the world’s greatest skiers as well as the celebrity elite. La Vallée Blanche is conveniently situated just off the slopes, a few minutes stroll down from Medran ski lift and is centrally located near Verbier’s shops, bars and restaurants. You'll have a perfect night's sleep in the 4 wonderful bedrooms of this Verbier chalet rental. The Master bedroom enjoys stunning views of the mountains beyond and a South-facing balcony: it is a quiet retreat with en suite bathroom and spa style Jacuzzi for two. Relax on goose down and feather bedding, listening to music, watch the Television invisibly embedded behind the mirror, watch a movie on the DVD player or Apple TV library or stay connected with your laptop or our iPads via wireless connection. You can relax in comfortwith old wood alpine styling, goose down and feather bedding in the second double bedroom. Contemporary fittings combine the state-of-the-art ‘Magic Mirror’ and computer technology with an ultra modern Megius steam and shower room. The alpine and contemporary styling of the third luxury double bedroom offers sleeping accommodation for up to three guests with a small double bed (120 cm wide) and a single bed. A bright bunk bedroom with a pull out third bed sleeps up to three guests. A sleek grey stone shower room and WC completes the accommodation. Complimentary welcome tray containing essentials including bread, milk, tea, coffee, cereal, jams, etc. 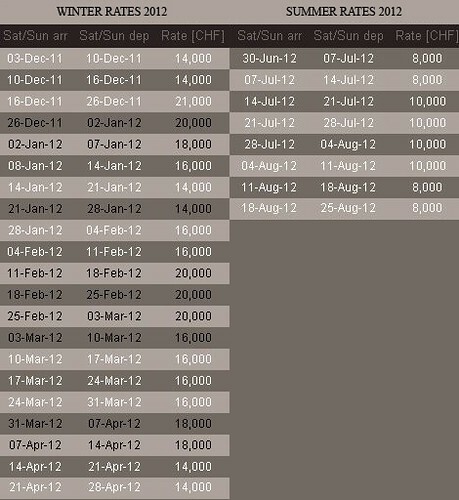 The services below ("Gold service") are available at a supplement of 1,750 CHF per group. The following additional services are available and prices will be quoted on request. The rental cost includes silver concierge service, water, electricity, heating, tourist tax, final cleaning and laundry.